Arthur, legendary King of England, became the code-name for the third generation PowerPC (PPC) processor, eventually named the 740 and 750. The successor of the 603e, these third-generation CPUs were optimized to run real software, not for some theoretical ideal. Early benchmarks show the 750 outperforming the 604e, making it look like the older chip would be reserved for multiprocessor designs and floating-point intensive work. In fact, a 233 MHz G3 was so efficient that it could hold its own against a 300-350 MHz 604e, so Apple moved away from the older CPU except in multiprocessor models (the G3 has very limited dual-processor support). The 740 and 750 can work in a dual-processor configuration. The key difference between the 740 and 750 is support of the Level 2 (L2) cache. The 740 has no built-in L2 cache support and is designed to use a cache on the computer’s system board. The 750 has built-in cache support and can use either an inline cache or a backside cache, both of which run faster than a motherboard-based cache that is limited by system bus speed. Of the two, the backside cache provides the best performance (and, of course, requires more expensive memory). The inline or backside cache must run between full CPU speed and one-third of CPU speed. The L2 cache may be 256 KB, 512 KB, or 1 MB in size. Both the 740 and the 750 used a 0.29 micron design initially and were available in speeds of 200, 233, and 266 MHz – followed by speeds up to 466 MHz. They can run at 3x to 8x bus speed, and up to 10x on the latest revision, which means a 500 MHz G3 is possible on a 50 MHz data bus. Considering the number of Mac OS computers built using 40 MHz motherboards, upgrades to 320 MHz were possible – but probably not practical. Beyond that, the Beige Power Mac G3 and tray-load iMacs have a 66 MHz bus and can support a 667 MHz G3, while the Blue & White G3 and slot-load iMacs can handle a 1000 MHz (1.0 GHz) G3 on their 100 MHz bus! Of course, the higher the CPU-to-bus ratio, the more important it is to have a large L2 cache. With speeds past 400 MHz, the PPC 750 was the workhorse CPU for the Mac OS until the G4 was unveiled in August 1999. Because of issues with cache coherency, we never saw a dual PPC 750 Mac using an inline or backside cache. The difficulty and time involved in checking motherboard RAM and the other cache would actually slow performance, as Be noted. If dual G3 systems are ever made, they should be on the fastest motherboards with the largest motherboard L2 cache possible. Motorola moved to aluminum fabrication and a tighter .22 µm die to produce the PPC 755 in 1998. The new CPU supported a 100 MHz system bus and achieved speeds as high as 600 MHz. The 755 was used in early iBooks. After this, Motorola essentially abandoned the G3 in favor of G4 (PowerPC 7400) architecture. Code named SideWinder by IBM, their second generation G3 was aimed at portables, although it found itself inside the iMac, too. The 750CX was available in speeds of 300 MHz to 600 MHz and supports a 100 MHz system bus, while the 750CXe supports speeds of 366 MHz to 700 MHz and a 133 MHz system bus. Both processors include an integrated 256 KB L2 cache that runs at full CPU speed. This eliminates the need for an external cache. IBM notes that the 750CX is approximately 5% faster than the PowerPC 750 processor at the same clock speed combined with an external 256 KB L2 cache. It is only 5% slower than the original G3 with an external 512 KB L2 cache. 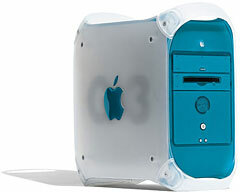 Although IBM was able to create fast G3s, Apple never released a G3 with a higher MHz rating than the fastest Power Mac G4 available at any given time. Still, the integrated L2 cache running at full CPU speed made the 750CX and 750CXe more than a match for the G4 unless a program was AltiVec enhanced. We expected the upgrade market to embrace the CX/CXe generation G3, which should support at least a 10x multiplier. This would allow an even more efficient 333 MHz upgrade for the PowerBook 1400, 500 MHz daughter cards for the upgradable first generation PCI Power Macs, 667 MHz upgrades for the Beige Power Mac G3, and up to 1 GHz upgrades for the Blue and White G3 and its 100 MHz bus. Apple adopted the 750CX with the second-generation iBook in September 2000. The 750CX was only available in 366, 400, and 466 MHz speeds; Apple did not use the 400 MHz version. The 750CX is designed for a maximum bus speed of 100 MHz, and it can run at up to 8x bus speed. This would allow a 533 MHz iBook using a 66 MHz bus, but the chip was never specified at that high a speed. This was the last version of the G3 CPU family that Apple used in iMacs. The Nintendo Game Cube was built around a 485 MHz Gekko PowerPC CPU based on the 750CXe but with 50 additional instructions and a modified FPU. Like the CXe, it has a 256 KB L2 cache. Code named Sahara, the 750FX arrived in 2002 and achieved a top speed of 900 MHz while also supporting a 166 MHz system bus. At the same time, the onboard L2 cache was doubled in size to 512 KB, further boosting performance. The 750FX was used in later generation iBook G3 models, starting with the 600 MHz May 2002 models. Introduced in 2004, the 750GX (a.k.a. Gobi) includes a 1 GB L2 cache and reached speeds as high as 1.1 GHz. Bus speeds to 200 MHz were supported, and a few third-party upgrades were made using this CPU, but Apple never adopted it. Nintendo’s Game Cube gave way to the Wii, which was built around an updated version of the Gekko CPU known as Broadway and running at 729 MHz. Like Gekko, it has a 256 KB L2 cache. The 7th generation Xbox 360 and PlayStation 2 are also built around PowerPC CPUs. The Wii U is believed to be powered by a triple-core version of Broadway, known as Espresso, running at 1.24 GHz. This novel design has one 2 MB L2 cache and two 512 KB ones. Great CPUs, past and present, John Bayko. See especially sections on 8080/85, Z-80, 6502, 6809, 680×0, 80×86, ARM (used in Newton), PA-RISC, Sparc, Alpha, PowerPC, and Itanium.